Some years ago, before he immersed himself into the professional legal world, the husband was actively involved in the business of… well.. being famous. LOL! Ok, ok let me start over. Some years ago, my husband got his kicks by becoming talents on commercials. Pretty soon, he landed one of his biggest jobs which was to host the Islamic teen programme called Hijrah Remaja. It was a rather interesting show, where teens shared and discussed their opinions on Islamic related issues in a very casual and laid back manner. His co-host was Waheeda and of course, since an actual celebrity was involved, the media got interested. Especially this particular one! Hahhahhaaha!! BUT! As I was admiring one of Adam Lambert’s music videos, was I ever so surprised to see this! Chayalahh yang!! 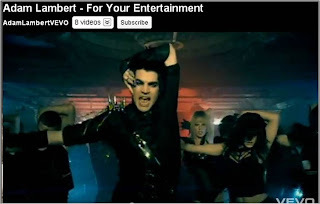 Adam Lambert pun buat pose telinga cam you gak!! oops. i just had to laugh. omg! omg! tak sangka nya!!! “saya bukan artis”- adam. hahahahahha. lawak gelak guling guling! which mag was this published in? btw chor, you changed your layout!!! tidak kejar glamour… kah kah kah! iteww adalah cara the Adam pose otay! hehehe….